Awhile ago, I was trying to work out an idea that I had for a necklace strap. I never ended up using the results for that necklace (doesn't it figure? ), but I do like the pattern I came up with. Probably someone has worked this out before, but I don't know who, or what it would be called. If you recognize it, please let me know...all I can say is that I came up with it independently and am calling it a Floral Chain. I used size 6/0s and 8/0s so that it would be easier to photograph. After trying it out, if you'd like to make it smaller and more delicate, feel free to experiment with 8/0s and 11/0s, or with 11/0s and 15/0s. 1. Pick up 10 6/0 seed beads and form a circle. Tie a knot and pass through 2 more beads. 2. Add 3 8/0 seed beads and stitch picots over every other 6/0 bead in the base row, five times. 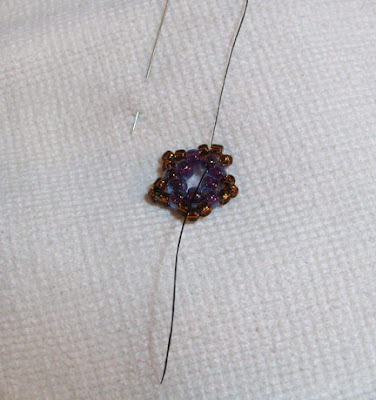 After the fifth picot with 8/0s, pass through 2 6/0 beads, exiting from one of the beads underneath a picot. Pass the needle out from the back of the link. 3. Pick up 9 6/0s and make a circle up and over the first link. 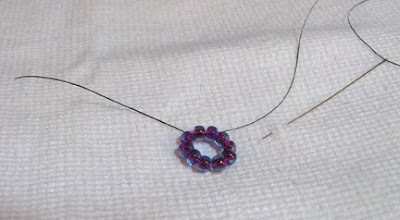 Pass the needle back through the first 6/0 bead in the circle, which is the bead from the previous link. Pass the needle from front to back, exiting out the back of the link again. 4. 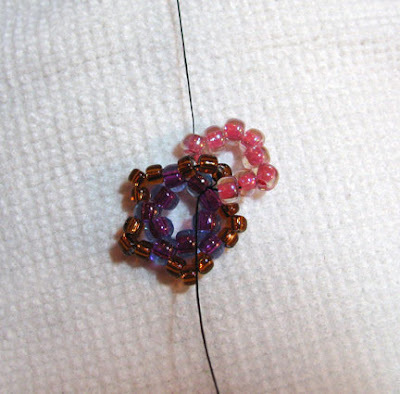 Flip the links over and pass the needle through 2 more 6/0 beads in the new link. Add 3 8/0s and stitch picots over every other 6/0, 3 times. 5. Flip the links over again, and create another picot, passing through the 6/0 from the previous link. 6. Flip the links over again, and add one more picot to complete the link. 7. Pass the needle through 4 more 6/0s in the circle and bring the needle out from the back to start the next link. 8. Repeat steps 3 through 7 as many times as needed. Wonderful tutorial Cindy. 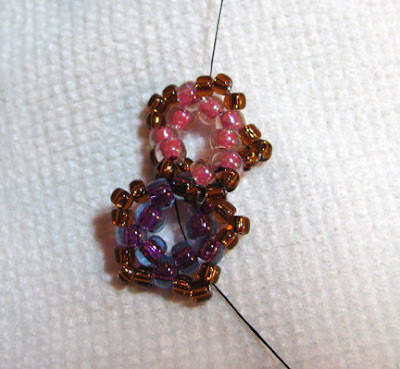 I think I'm going to try it out tonight with smaller beads. 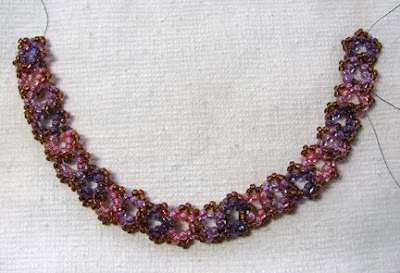 Also found a link to your beaded bauble tut. Such a cool idea! I want to try that on a flat disk type bead-hoping my idea will work.. It is lovely and - no, I've never seen the pattern before. Wouldn't it look gorgeous sewn around the neckline of an evening dress? I love this, Cyndi... as well as doing it on a smaller scale to look like lace, I think it would be fabulous done in dramatic and large beads to look spectacularly ethnic. Perfect project for this rainy Sunday morning. Thanks for the tut Cyndi. I love your little flowers and plan to make some soon. I was looking at the photos and WHAM! the exact seed beads I've been searching for, the 6/0's in the tut, What are they?? What are they called? I've been told to look for "clear, color-lined,... " but no one seems to have what I'm looking for or if they do they have only three or four colors... HELP! The very first one on the list, WhimBeads, has lots of 6/0 colors available :-) I'd love to see a picture of your chain when you're finished!